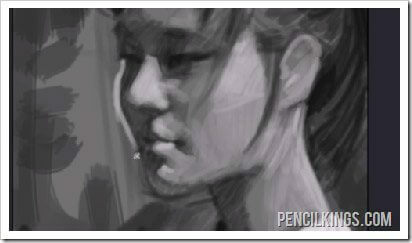 Here’s a look at the finished image that you’ll have at the end of this lesson on realistic portrait painting. 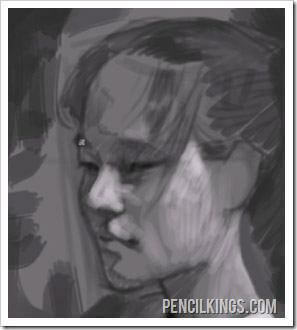 Are you ready to learn more about realistic portrait painting in Photoshop? Now that the major dark shapes have been defined you are going to want to start adding in some of the light values. You’ll notice that as the instructor begins painting the light value looks quite bright, however this value is 22% gray and is quite different from actual white. It’s interesting to see the strong contrast between the gray background and this lighter gray that you’re using to paint in the light values. The human face rarely has any areas on it that will use full white, and you should reserve this only for areas that have extreme highlights on them. At this stage of your painting it’s not necessary to press too hard with your pen because you want to reserve those really dark darks and really bright light values for a later stage. This is of course, one way to approach a painting and there’s several different ways that you could use. I personally like this approach because it offers a lot of flexibility and room for potential error and experimentation. When shading in the hair it’s important to remember the direction that the hair is flowing in to paint your strokes following the natural flow of the hair. 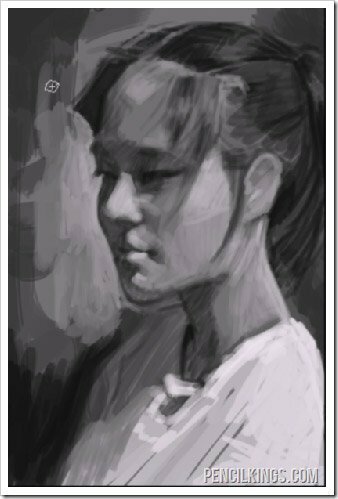 As you continue to work though this tutorial on realistic portrait painting, you’ll begin to have a wide variety of values that you can choose from. You can use the “Alt” key to change your brush into an eyedropper tool and quickly grab colors from your canvas so that you won’t have to go to the color palette. This simple shortcut will save you a lot of time, and is something that you should incorporate into your workflow if you aren’t already working this way. While you’re working try to have a holistic approach where you don’t spend too much time detailing one area. Working this way will ensure that your entire painting evolves the same rate. Another way to think of this process is to work on large details first and then go into the smaller details. 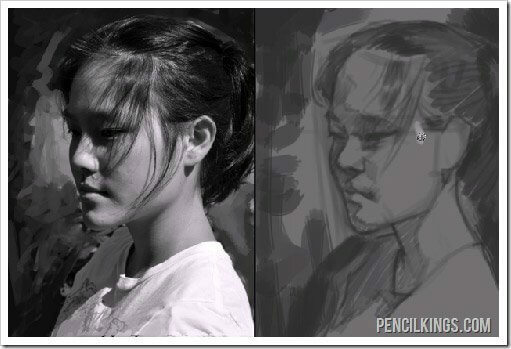 To help establish the other edge of the face one thing that you can do is lighten up the background which will give more contrast to the silhouette. You can use a thin line at first to define the lighter area in the background and then begin to blend it into the other areas of the background. As you watch the video to accompany this realistic portrait painting tutorial, you’ll see how this technique really makes the outer edge pop. Here’s a what the image looks like at the end of this lesson now that the light and dark values have been established and some additional work has been done on the background to provide some contrast against the edge of the face. 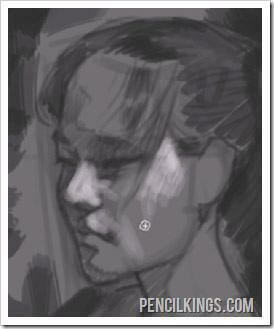 We hope this article has helped you learn lots about realistic portrait painting in Photoshop. Why not leave a comment below?